Last weekend, my wonderful spouse suggested we make the drive to a huge flea market about two hours distant. We always love a good thrift shop or flea market, but this time there was an added attraction: a “cars and guitars” swap meet event. I readily agreed this would be a great way to spend a Sunday, and we were off. On the way, we talked about what we hoped to find, and agreed on a reasonable budget for any guitar-related mischief I might get into. The flea market itself was most impressive – easily one of the best we’ve visited, and too large to see everything in a day. The car show was a lot of fun, as well: the highlights included a smokin’ mid-70s Firebird Trans-Am, a jewel-green 60s Chevelle, and (for us 80s kids) a shiny DeLorean. Though the guitar swap meet was a bit smaller than I’d imagined, it didn’t disappoint, either. Upon arrival we carefully made the circuit, seeing what each vendor had to offer. I was pleased to find that many of the guitars were quite reasonably priced; there were several interesting possibilities within range of my budget. I eventually narrowed my options to a Harmony solid-body (possibly an H-802) and an odd little no-name guitar with a flashy, striped aluminum pickguard. It wasn’t an easy decision, but the oddball ultimately came out on top. Now came the time to deal. My first question for David, the gentleman manning the booth: what is this thing? He proudly showed me a “Made in Japan” decal adhered to the back of the instrument, and told me it was a mid-1960s Teisco. Subsequent research suggests it’s probably an E-120 model, but it gets even more interesting. It seems that David, who balks at describing himself as “retired,” combs thrift stores, flea markets, and pawn shops looking for salvageable guitars in any condition. He then cobbles the various bits and pieces together into serviceable instruments. It turns out the guitar in question is a Frankensteined assemblage of parts that transcends international borders and links several decades. 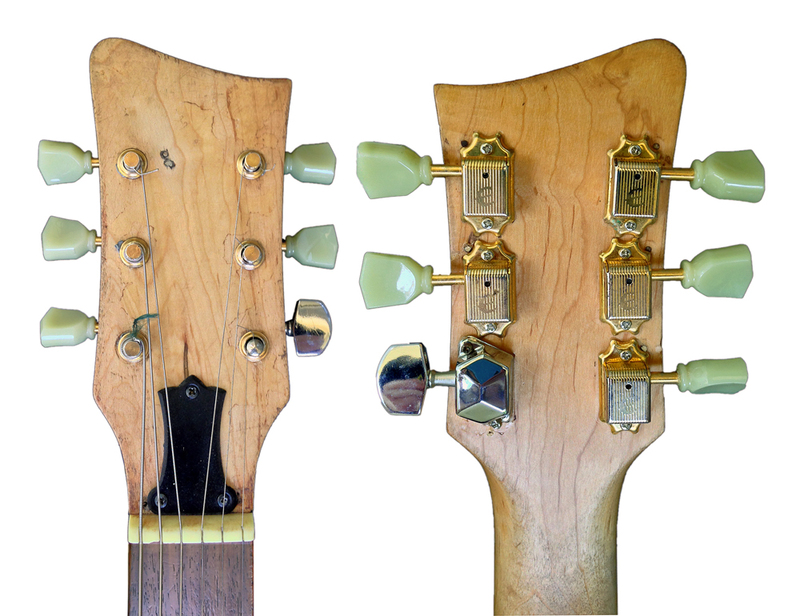 Front (left) and rear (right) views of the First Act headstock. I wanted something out of the ordinary; this guitar certainly fit the bill. 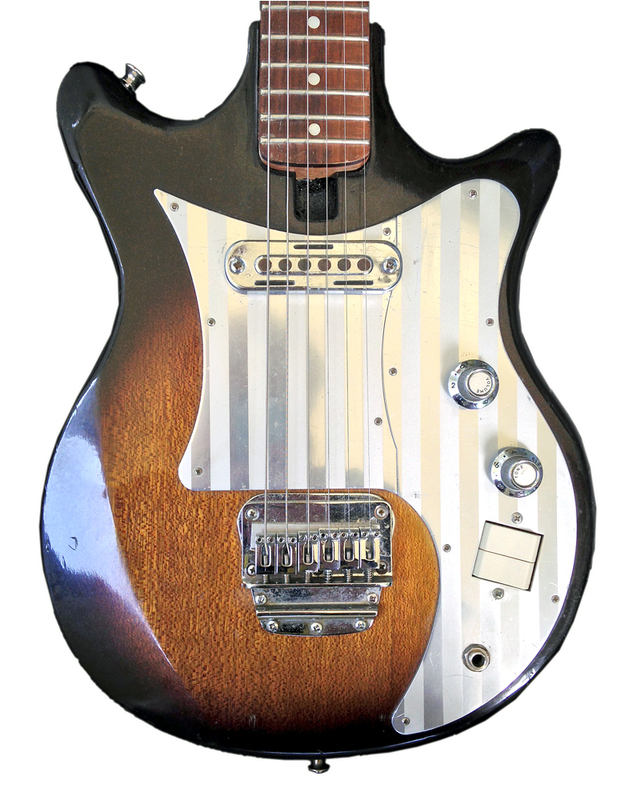 The body was indeed made by Japanese manufacturer Teisco around 1965. The neck once belonged to a modern First Act electric – yes, the same budget brand you may have seen for sale at your local Wal-Mart. As you can see in the image above, the tuners are mismatched – five gold Epiphone tuners, plus a generic sixth finished in chrome. David told me the bridge is a Fender hardtail that came off an old Strat he had lying around the workshop. It appears to be screwed directly on top of the original bridge plate. How could I not plug it in and give it a try? I was pleasantly surprised to find that it plays well and sounds pretty good, too. You can click here for a brief sample. Both the riff and lead parts are played with the Teisco; there’s a bit of fuzz added to the rhythm part, but the lead is a clean signal directly from the original, single-coil pickup. Please listen with kindness; solo improvisation is not my strongest suit. So, $40 later, I’ve found my project guitar. For now I’ve promised that I’ll do nothing to alter it, giving myself a chance to discover its unique characteristics. I’m certain, though, that there will be updates to the tale of the Frankenstein Teisco.